SAFe’s definition of the value stream is “Value Streams represent the series of steps that an organization uses to build Solutions that provide a continuous flow of value to a Customer. SAFe value streams are used to define and realize Portfolio-level business objectives and organize Agile Release Trains (ARTs) to deliver value more rapidly.” This is a subtle difference from the long-standing definition of a value stream – “A value stream represents the series of steps undertaken from beginning to end for a specific product or service in order to provide business value.” In other words, value streams are about our current state and not what we want it to be. We don’t define a value stream as much as we refine one. Value stream mapping is a way to see what is working and what isn’t. It focuses on the delays in deliverying value. SAFe’s use of the term just needs a slight clarification. While value streams are technically about one product or service, SAFe is trying to underscore that we want stable value streams. That is, improvements to a product or service would be best served by each having the same value stream. While that’s not quite the classic definition of a value stream it enables one to think about the desired stability of Agile Release Trains (ARTs) if we had that. This distinction between the current value stream for a particular product or service and the idealized value stream for the series of related value streams can be used to help improve our processes and organization of our talent. Value streams are particularly useful when they cut across multiple parts (e.g., programs) of the organization. One purpose of the value stream is to make this visible. One of the most popular books on DevOps, The Phoenix Project, is really a book on Lean, using DevOps to illustrate lean principles and how to create visibility. Realizing that the value stream is an end to end construct, enables us to recognize that when we attend to only one level we are leaving part of the value stream out – something that has consequences. This is especially important when starting off adopting SAFe with Safe Essentials because although you may adopt SAFe at the program level, there are implications of attending to only part of the value stream. This is a modified diagram from our Viewing SAFe from a Value Stream Perspective webinar (recording and PDF available with registration). The ‘flower’ on the left are 6 objectives required for Agile at scale disussed in the talk. Value Stream Mapping. 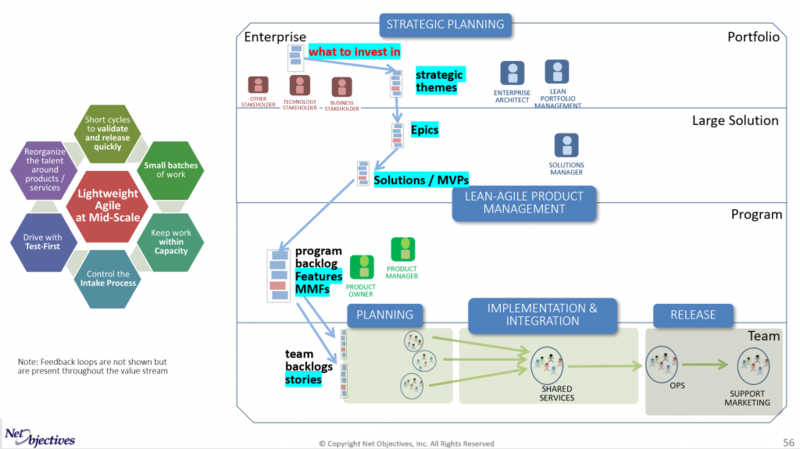 This shows how to create a value stream map. The Value Stream Impedance (VSI) Scorecard. We have found that by looking at the value stream you can see where your work is being slowed down. The VSI Scorecard is a way of guiding decisions by seeing if you are improving your value stream or not. Understand Your Value Stream is an article about why looking at the value stream is so important. For an example of how value stream mapping can sometimes create fantastic results, see page 18 from the chapter An Agile Developer’s Guide to Lean Software Development in our Lean-Agile Software Development:Achieving Enterprise Agility book.